Domestic stock market indices closed at new highs in August as earnings and economic data helped propel equity prices. Even with recent new highs, volume remains relatively low. Some market analysts believe that the increased regulation of banks and brokerage firms has taken a toll on trading. The use of various derivatives have been discouraged by regulators, which have in the past added activity and volume to equity markets. The positive performance of the high-yield bond sector so far this year is indicative of improving credit characteristics for smaller company stocks. Since most smaller companies tend to rely more on debt for cash flow, a continued low rate environment has been beneficial for earnings and growth. REITs currently constitute about 3% of the S&P 500, so it is estimated that the newly created 11th sector will make up about 3% of the total index. 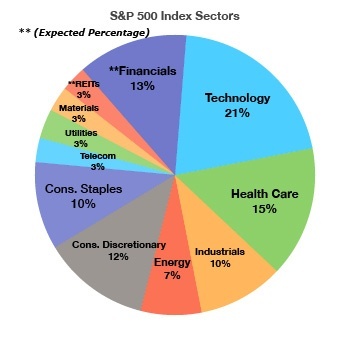 Sector weightings comprising the S&P 500 vary as the economy shifts and industries evolve. Technology currently encompasses the largest portion of the S&P 500 at 21%, yet made up as much as 35% in 2000 during the height of the technology boom.